Johannesburg, 23 September 2016 - CITES Parties will soon be able to freely access the world’s largest ivory database compiled using state of the art forensic techniques developed by Germany. 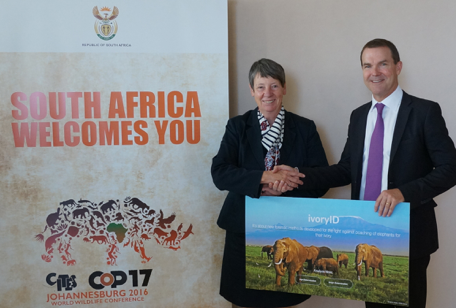 German Minister for the Environment Barbara Hendricks symbolically handed over the IvoryID database to CITES Secretary-General John Scanlon at #CoP17 in Johannesburg yesterday. John E. Scanlon, Secretary-General of CITES said: "The use of modern forensics is a game changer in the fight against illegal wildlife trade. We are deeply grateful to Germany for developing a forensic technique that can determine the age and origin of ivory. Criminals illegally trading in ivory can no longer hide behind false claims of where and when they got their ivory". The database – which can be accessed through a dedicated website - contains more than 700 reference samples from 30 African countries using data obtained from elephant ivory, with proven origin, provided by countries of origin, museum, hunters and others. Germany has developed a forensic technique based on an analysis of isotopes that can determine the age and origin of ivory. This provides critical information about poaching hotspots and trade routes used by traffickers. The composition of specific isotopes used to determine origin differs significantly between geographical regions and ecosystems across Africa. This chemical fingerprint is imbedded in the ivory during the growth of the elephant. Proof of age can provide crucial evidence in court cases to determine if material has been recently poached or is antique. The IvoryID-website, which will be available from http://www.ivoryid.org also contains information about certified laboratories in the world that are able to apply these methods.